By the early 2000s, President George W. Bush sought to extend the NAFTA. However, critics argued that the Free Trade Agreement of the Americas (FTAA) could split South America. So the initiative crumbled against opposition by Brazil and its progressive President Lula. In the Obama era, Washington began to tout the Trans-Pacific Partnership (TPP). This initiative originated from a 2005 free trade agreement among just Brunei, Chile, New Zealand and Singapore. After 2010, Washington began talks for a significantly expanded, “high-standard” free trade agreement, which would reflect U.S. alliances in Asia and Latin America but exclude China. While the original TPP was small but open, inclusive and had room for both US and China, the Obama plan sought to attract a dozen nations but grew secretive, exclusive and shunned China. Yet, it was an integral part of Obama’s “pivot to Asia,” which was intellectually formulated by former Secretary of State Hillary Clinton. That vision is now history. If the regional free trade agreements drafted by advanced economies were energized by the fall of the Berlin Wall in the late 1980s, their demise today is characterized by the Trump dream of a Wall against Mexico. Along with the TPP, Trump will seek to re-define the NAFTA and the proposed Transatlantic Trade and Investment Partnership (TTIP) pact with Europe. Meanwhile, free trade initiatives will shift to emerging economies. After the US presidential election, some of Obama’s TPP partners – including Japan and Mexico – pushed for a modified TPP agreement before Trump could tear up the agreement. Prime Minister Abe hoped to hedge between a revised TPP, a bilateral free trade deal with the US, and China-led talks at a Regional Comprehensive Economic Partnership (RCEP). But the RCEP is no alternative to either US- or China-led broad trade pacts. It reflects the interests of emerging ASEAN economies (and their trade partners in advanced economies), but has a slower implementation schedule and humbler goals. Ever since the Trump triumph, apprehension has also spread across Latin America, which is struggling to prepare for the Fed’s impending rate hikes. In the past week or two, Mexican peso, Brazilian real and other Latin American currencies have already suffered heavy hits, which have been mirrored across the Pacific by the sell-off of Asian currencies. Until recently, the U.S. pivot in the Asia Pacific has relied mainly on increasing security cooperation, whereas China’s focus is on economic development. Since 2013, President Xi Jinping has proactively pushed for broader economic ties with both emerging Asia and Latin America. In Lima, Peruvian President Pedro Pablo Kuczynski said that, if the US pulls out, he would support an Asia-Pacific trade accord that includes China and Russia. Like Peru, even Australia is now moving behind the China-led Free Trade Area of the Asia Pacific (FTAAP). Ironically, China’s initiative builds on a U.S. plan. In 2006, C. Fred Bergsten, then chief an influential Washington think-tank, made a forceful statement in favor of the FTAAP, which he thought would represent the largest single liberalization in history. This initiative would be relatively open, inclusive and have room for both US and China. Indeed, Beijing’s push for an Asia-Pacific free trade area has been more active since fall 2014 when I predicted that, as a more inclusive and open plan, it had potential to achieve reflect real free trade in the region. Oddly enough, the Obama Administration rejected the free-trade FTAAP for the geopolitical TPP, which China argued would have imposed a Cold-War like Iron Curtain on Asia Pacific by splitting the region between a US-dominated block and China’s allies. 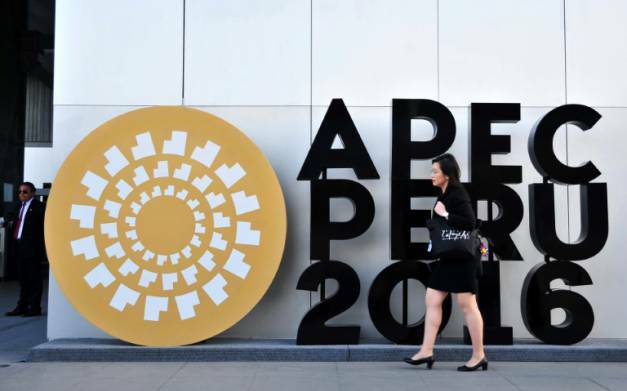 Today, APEC’s membership has almost doubled to 21 countries, which account for almost 60% of the world economy, and nearly 50% of world trade. Beijing’s logic is persuasive: if you can make it in APEC, you can make it everywhere.